We'd like to announce an update to our rule-based pathways visualization tool which allows you to follow signaling pathways as they propagate through the cellular networks. Unlike other tools, we've built VisiPaths to be fully interactive so that the user can alter any node property and visualize the changes it causes to signaling outcomes. The user can also set any node action in a time-like fashion, using complex constructs such as adding a delay function for a specific connection. And we've worked hard to build a complex and powerful toolset that allows you to separately configure and set early signaling events (such as protein phosphorylation/acetylation, etc) and late (transcription) signaling events . And once you configure a pathway, the VisiPaths app will do the hard work of automatically visualizing its oscillations. VisiPaths supports nodes with unknown kinetic characteristics (inferred indirectly from cell and animal studies). VisiPaths provides a powerful interactive graphical platform to assemble pathway maps in an intuitive way. And to help users get started, VisiPaths includes several pre-assembled pathways which could be further altered by the user. As a special Valentines day present to all our users we'd like to introduce the beta of VisiPaths.com! 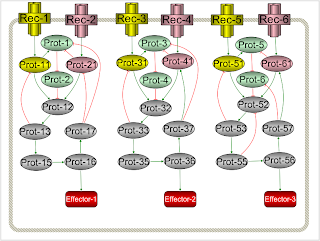 Once a pathway is loaded and setup, the user can also alter any node properties, including activity and connections, and visualize the changes it causes to the signaling pathways - all in realtime. With the ease of using a standards compliant web-app, you can modify any parts of the pathway including adding new nodes and creating new connections/interactions to test how they would affect overall signaling pathways. All node actions can be based on a timer using delay function for each connection. This allows to see separately early (protein phosphorylation) and late (transcription) signaling events and also allows to visualize oscillations. The app is available as a limited beta to the general public. We invite you to visit VisiPaths.com and signup for an account now. We are happy to extend out commitment to the scientific community by announcing our updated suite of products with ScienceSlides 2010. For this latest release, our content has been further expanded and updated. Many fields have been revised, including mTOR protein, Ion Channel physiology, Calcium Homeostasis, Cytoskeleton, mRNA processing, Growth Factor, Tumor Suppressor and Oncogene signaling, TLR and Fcgamma signaling. Significant expansion has been made in Molecular Pharmacology and Medicinal Chemistry. Visit out store for pricing and delivery options.